I like french fries. There I go messing with my foodie street cred once again. I know I should say things like, "I fancy grilled ramps" or "I relish sunchoke gratin" but the truth is, I like french fries. So much so that when a meal includes two side dishes, I'll often order double fries. When I'm stranded at an airport and attempting to be healthy, I'll forego the sandwich at McDonald's just so I can get a large fries. Unfortunately, my love of french fries has manifested as soggy, limp potatoes everytime I've attempted to make french fries at home. I've still eaten them mind you because I'm picky, not crazy. Anything even remotely reminiscent of a french fry immediately gets gobbled by yours truly. But, the quest for the perfect homemade french fry has continued. I've tried the double frying method, the pan frying, the frying then baking, and the angrily staring at the potato method but nothing has yielded the perfect french fry- crispy on the outside, deliciously moist and mealy on the inside. A few days ago, I read about the great french fry experiment at Serious Eats. A kind soul had actually taken the time to document his various attempts and had posted a recipe promising the perfect french fry. He had me at perfect. I started out bright and early because I wanted to eat the french fries the same day. I know it says to freeze them overnight but I'm still working on the whole patience thing. I figured in the fry downtime, I could concoct a delicious curry mayo and feel all European while eating my french fries. Peel, cut, boil, drain, cool, fry, freeze, fry yet again. In the interest of full disclosure, these fries take a long time to make. Theoretically, you could make a giant batch, freeze, and fry them as needed over the next month (or more realistically, next week). I cannot attest to this since we made the entire batch as soon as they were frozen and attacked them like we hadn't eaten for weeks but it sounds like a good plan, in theory anyhow. Also, if you don't have a deep fryer, it's a bit of a pain to regulate the oil temperature in the pot before each batch goes in. But the work is worth it. The recipe yields a french fry that is, without a doubt, the best homemade french fry I've ever made (and I've made a LOT of homemade french fries). Golden and perfectly crispy on the outside, tender and potato'y on the inside. Sprinkle with salt and you've found your new best friend. Oh, and one last thing. You should make your flavored mayo or dipping sauce of choice well ahead of time because once the french fry process starts, you'll be too interested in tasting the fries at each step to make anything else. What did I do while the fries were freezing, you ask? Sat and stared at the freezer impatiently. Oh, and watched The Blind Side (great movie, by the way). So tell me, what is your french fry dipping sauce of choice? 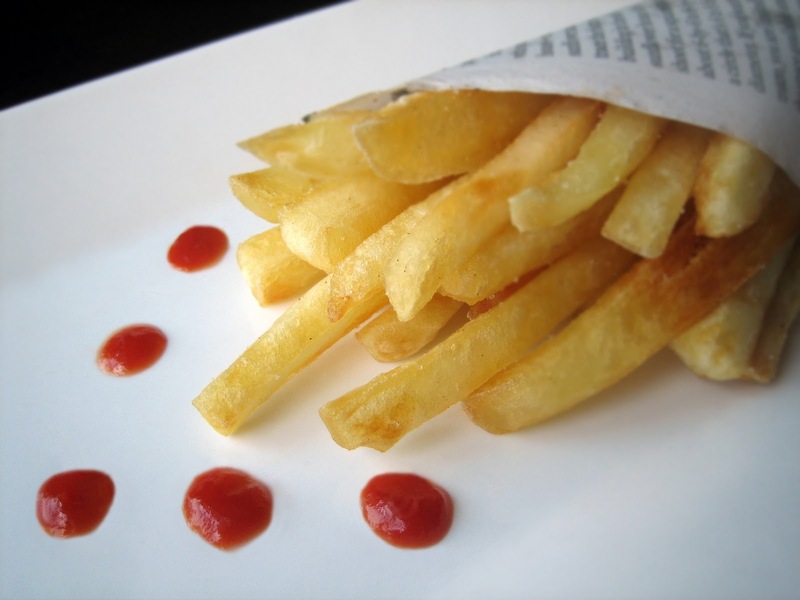 now that sounds just too good, home made fries, done the right way, and a perfect dipping sauce...I might have to try them with a little vinegar or just ketchup, Heinz of course!! sometime taking the time to make something that you want to be perfect is a worthwhile effort....making perfect fries would qaulify in my book!! Haha, I loved reading this post and there is no shame in admitting to loving french fries. :) I am not quite sure if I have your patience, but these fries really do look amazing! Seems like your long quest for the perfect fry has paid off! That article was hilarious when I read it the other day. I'm seriously considering indulging. BTW, join me in my SCOTUS boo re: today's Miranda decision. Give me french fries over frou frou food any day! Those french fries sure look perfect! Yum! They look so nice! I've seen many recipes that are boiled, baked then fried. Effort is definately invloved but it's so worth it in the end. P.S My dipping sauce of choice would definately be mayonnaise! I love french fries too! Garlic aioli is my perfect dipping sauce. My mother washes the fries a few times and then lets them dry completely (in a towel) before putting them in the oil. I love the new picture and site! And the post of course! Excited to try this recipe! I have a weakness for french fries topped with feta and oregano. Yum! The fries look awesome. I am a fried potato addict. The Belgium method of double-frying the potatoes is time consuming but ultimately rewarding. Favorite dipping sauce...my spicy ketchup. I might share that one in the future. LOL! I'm with you on the french fry obsession. My favorite, and so non-foodie place for fries was Der Weinerschnitzel in Irvine on Walnut and Jeffrey - perfect ratio of salt to grease. I eat mine plain, savoring the salt or with ketchup. Looks like you mastered them! Don't be ashamed of your love for fries. Foodie or not, everyone has a soft spot for a fried potato and they're lying if they tell you otherwise! If that is not dedication to the perfect French Fry, then I have no idea what is. I can't say I've attempted making fries at home, I'm lazy. If I want them I'll venture to McDonalds or I'll put McCain spicy fries in the oven. One day when I'm feeling ambitious as well as patient, I'll attempt these. 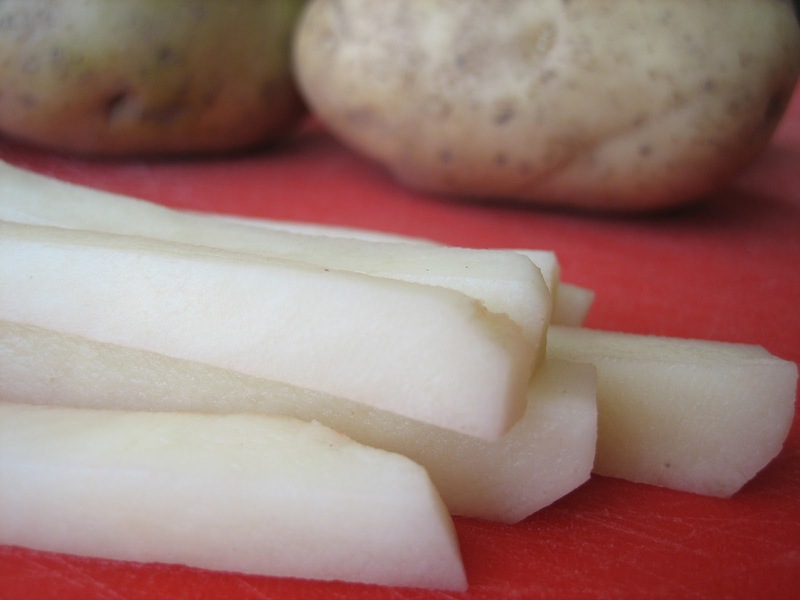 But it is very comforting to know that there is a method to making "the perfect french fry" at home. I love French fries too and yours look fabulous! My favourite dipper is definitely garlic mayo...ooo, la, la! Island Vittles- That sounds like an interesting option. I will definitely try that soon. Perhaps a head to head showdown between the two options? BB- I'm concerned about SCOTUS. Kait- Garlic aioli is a great choice! Baahar- Your mother's recipe sounds much faster than this one and I'm all for faster! Lazaro- Spicy ketchup is a solid choice! OC- The ratio of salt to grease is key! Coley- I like that! Everyone has a soft spot for a fried potato. Denise- A perfect fried egg definitely counts for foodie street cred! They look to die for! I have never boiled my potatoes first, but I guess it must give great results! I love French fries but this looks a lot of work to me. I always just buy the frozen ones and bake them. Just had some this afternoon with salmon. But nothing can beat homemade ones. Yours look perfect! american mustard - yeah it's kinda strange but kinda good! Thank you for this recipe. Even though it's a bit time consuming it sounds like it's well worth it in the end. 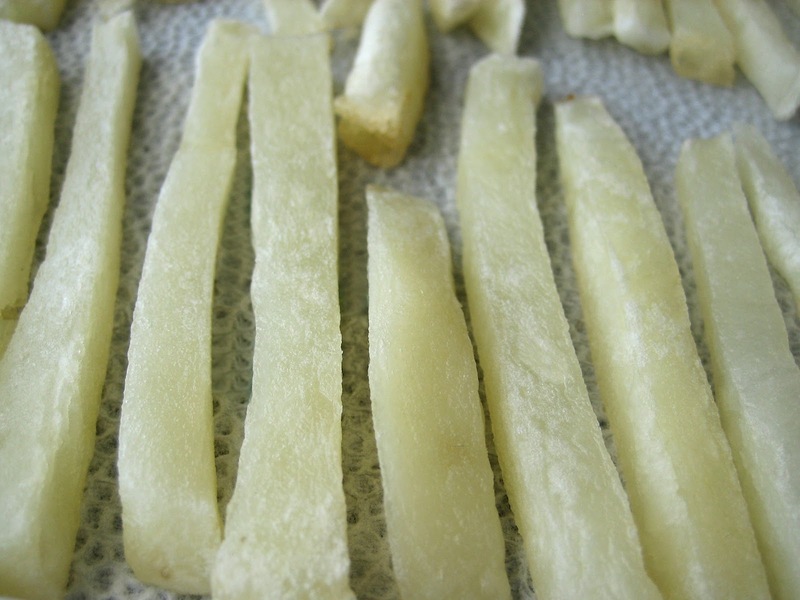 If you want some amazing pommme frites :) ...fry them in rendered duck fat. I'll be doing that soon and writing about it. Give it a try, fries are incredible in duck fat! These seriously look like McD's fries. Crazy! I'm so trying out this technique. :D Thanks for sharing.